Still moored at Brownsover opposite the designated 24 hour mooring along with the other bridge hoppers. This morning two vans appeared in the car park opposite the boat and the occupants sat around for a couple of hours until a truck lorry arrived with a 20ft ISO container. The container was eventually placed on the ground and a temporary fence erected around it. Obviously some work is going to be completed in the park. 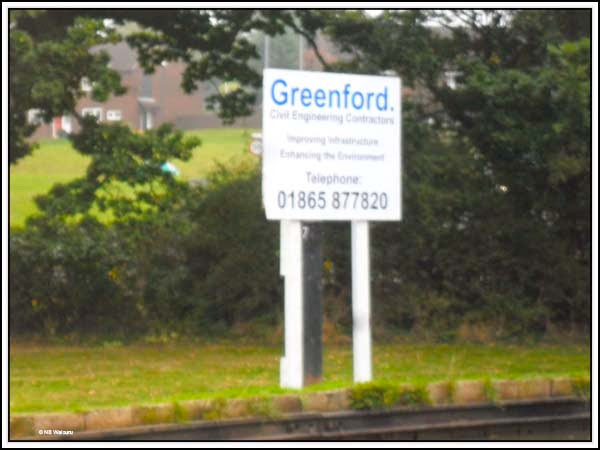 We know the contractor is Greenford Civil Engineering Contractors because the employees erected a sign facing the canal. It appears they didn’t want to go to a great deal of effort because rather than dig two holes for posts they fixed the sign to the CRT 24 hour mooring sign obscuring it! I guess it won’t be long before some boaters take advantage of the “new” 14 Day moorings! Our plan is to take a winter mooring in Rugby for the four months from November to February. It will give us an address thereby allowing some personal administration to be completed. Signing on with a doctor has already been organised and now a dentist is required. Not being familiar with the dental system in the UK a search in Google was required. It appears the system is somewhat like supermarket food. You can go to Lidl or Waitrose. They both sell food but the service/quality might vary! Most dental practices do both NHS and private work however the NHS has a fixed, and subsidised, fee for various treatment whereas the cost of private work is negotiable. I identified a potentially suitable dental practice in Rugby on the NHS website that appears to have good customer reviews and walked into the town centre to see if they were accepting NHS patients. Apparently dental practices can limit the number of NHS patients on their client list. The practice actually had a sign out the front advertising they were accepting NHS patients which was a good start. After looking at the number and names of dentists at the practice it appears there may be at least one new dentist which is probably why the practice is advertising for patients. The first appointment is now arranged. No doubt it will be for an examination rather than any remedial work. Like many people, I’m not particularly keen on visiting the dentist. I had two bad experiences when I was quite young. In NZ primary schools have a visiting dental nurse. My first school was in Waiouru (yes, the boat is named after the place). The dental nurse was only a slip of a girl and the drill was worked by a foot treadle much like old manual sewing machines. She had to work the treadle with her right foot whilst simultaneously drilling teeth. Unfortunately she used to get tired and the drill bit would jam in a tooth. To extract it she had to stand and jump on the treadle. My second bad experience was after our family had returned from three years in England where my tooth cavities had been repaired by an English dentist. Back in in NZ the dentist discovered the fillings had been done incorrectly and their was significant decay under them. All the work had to be redone and four teeth were so rotten they had to be extracted. The dentist did all the work over many sessions without using an anaesthetic. I won’t mention the dentist in Iran as it’s somewhat gruesome! The NZ Army seemed to take perverse pleasure in scheduling soldiers annual dental appointments on their birthday and I’ve keep the routine going. It’s one way of reminding me I’m a year older.